Because I don't have enough on my plate, I have created a stack of books I need to read before the holidays begin. The comic books are no problem to get through, but the novels, that may cause a bit of a problem. But I'm up for the challenge. I've started reading the Batman book already, and the Catwoman one should be a breeze. 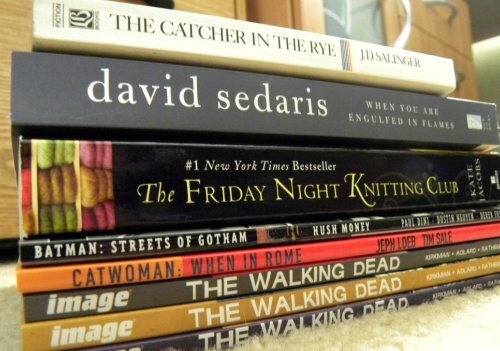 I had already started reading The Walking Dead series awhile ago, but took a break to finish some other series first. Now I need to read up on the next few book as the next season on AMC starts in October! Can't let there be any spoilers, if they keep close to the books that is. I have also found that I am one of the few people who wasn't forced to read Catcher in the Rye in highschool. So I feel the need to catch up on that as well.